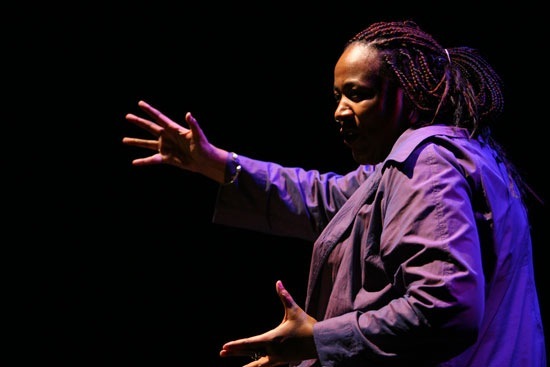 Pulitzer Prize finalist Dael Orlandersmith’s Stoop Stories is poetically written and powerfully performed. The smooth sounding sentences of Orlandersmith’s speech also tell us direct stories. 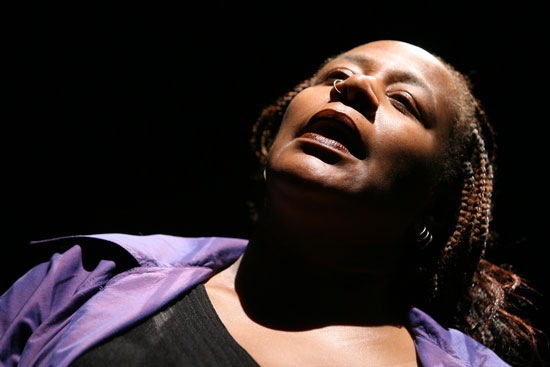 Stoop Stories is not a poetry reading, it is a collection of memories shared to us by over ten different characters played by the author herself, Dael Orlandersmith. Orlandersmith goes back to her home in Harlem, on a stoop where so many lives have passed. Through different characters of various races, ages and sexes she uses stories told around the stoop to talk about the place in New York where she grew up. There is not much individual character development, but Stoop Stories is not about the specific individuals or the individual narratives that are being told. It is about her and the neighborhood she grew up in as a whole. Orlandersmith brings the audience back to the old days of Harlem with characters such as a heart-broken 81-year old Holocaust survivor who tells a story about when he shared a moment with Billie Holiday (the 2nd best scene), and up through the years to the time when she was a girl fighting to escape the stoops in Spanish Harlem. In telling her own story, Orlandersmith also tells stories of other peers she grew up with who had similar aspirations but their lives don’t all share in the same happy ending she acquired. The best part about this play is the writing; the sensual arrangement of words. The performance by Orlandersmith lives up to the script’s high standards, although the storyteller was dwarfed by the overwhelming size of the set. Orlandersmith is alone on a large stage and the backdrop is a huge oversized stoop with the authentically plain concrete exterior of a home in Harlem. The backdrop is wonderfully done and striking to look at, but it takes away from the storyteller where the attention should be focused. Orlandersmith can hold her own on stage without such a bold set. She is the type of performer that thrives when all eyes are only on her and grabs our attention through her words and the places they take us. The stoop is where the stories are being told between characters in the memories of Orlandersmith’s mind, but Orlandersmith steps away from the set to tell her stories to us so that she can take the audience to the places within her words. The stage has a dream-like setting created by lighting designer Keith Parham that gives one the feeling that someone larger than life is coming out at dusk to share tales directly to us. 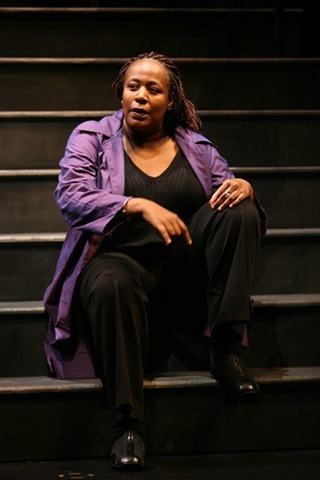 The atmosphere singles out the speaker in the beginning of the play as a storyteller, and along with the purposefully chosen music, helps create smooth transitions as Orlandersmith changes into different characters for a new point of view on Harlem. The direction of Jo Bonney moves this performance along rhythmically blending the compilation of narratives together to tell a larger story. 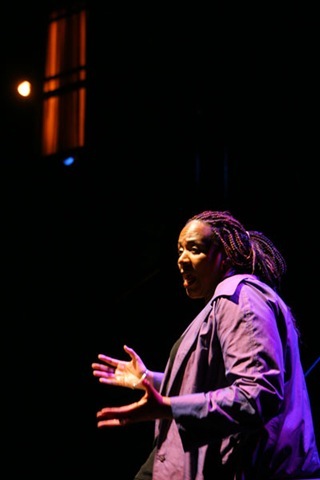 Dael Orlandersmith’s speech is musical; a powerful dramatic spoken song. It had me rocking ‘n’ rolling to her sensual stories of the mixed-bag of lives that passed by the streets of Harlem. 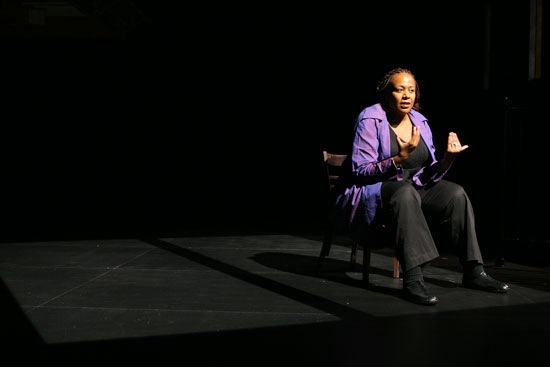 Stoop Stories is a deeply personal story, and Orlandersmith lets us see the emotional side of her past and how she made choices to escape the trappings of the stoops in Harlem. This is a performance most people can identify with in their own way. Everyone has “Stoop Stories,” whether they are shared around a stoop in the west side of Chicago, the backyard in the suburbs or on stage at the Goodman Theatre.